Shop Gator GP-FUSION16 Fusion Series 5 Piece Drum Set Bags from AMS with 0% Interest Payment Plans and Free Shipping. 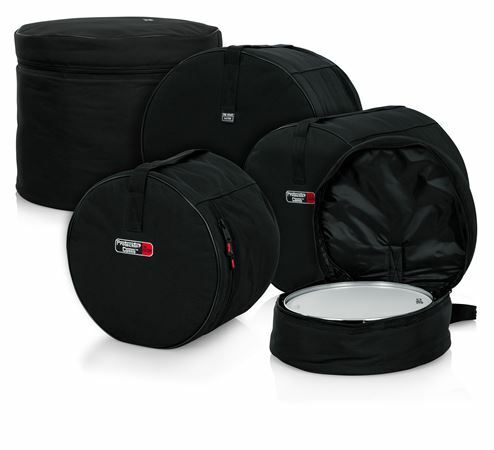 Lightweight and durable, this 5-piece set of padded nylon bags for a Fusion drum set provides road-worthy protection. This 5-piece drum bag set accomodates: 22"x18", 10"x9", 12"x10", 16"x16", 14"x5.5". Great quality and sturdy. The drum set fits perfect and the quality is very good, especially for the price. I recommend this set. Great product. Have used for many years. I play more than 100 shows per year and they last a long time!! Excellent protection for your drums. So far pretty decent. Have to see how they hold up in time.